Shades have evolved over the last 20 years and now include a wide variety of Fabrics, Features, and Functions to fit almost any need. Shades can be used to enhance your design style, provide UV protection and insulation, or give you just the right amount of Privacy and Light control. Nearly all window treatments can now be automated using a wide range of AC, DC, and battery powered motors with electronic controls. These treatments are used daily for hard to reach windows such as those found in Foyers or over Bath tubs. 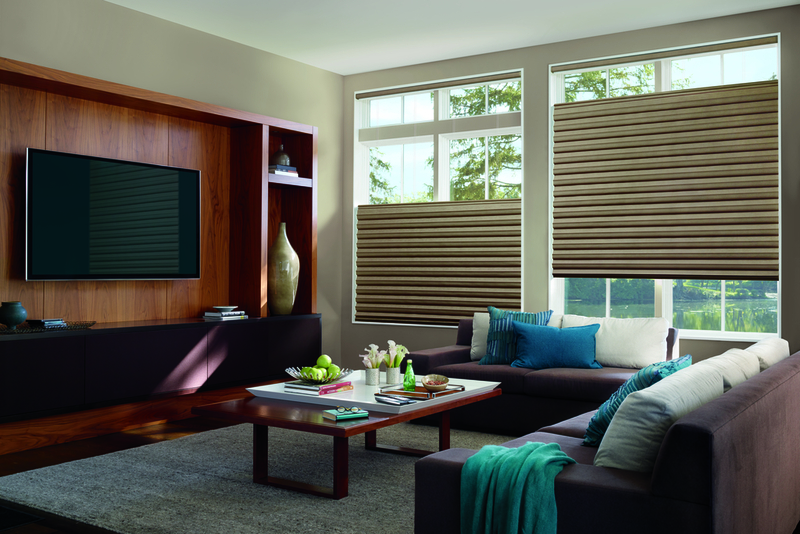 Motorized window treatments also add security to the home by eliminating dangerous cords and by automatically closing at a pre-selected time to maintain privacy in the home. The same touch screen or wall panel that is used to adjust the lighting and audio visual equipment can also be used to adjust the window treatments for the perfect Home Theatre experience. 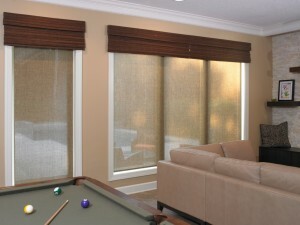 Honeycomb Shades are a very versatile product. The insulating cellular design of the Honeycomb shade allows clients the ability to stay warm in the winter and cool during the summer. Honeycomb shades are also renowned for their tight gather when raised which allows clients an uninterrupted view of the outside. Additionally, they have a wide range of Opacity options from Light Filtering to Blackout. 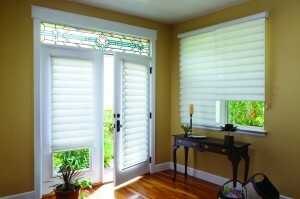 Honeycomb shades are also a possible solution for Specialty Shaped windows. 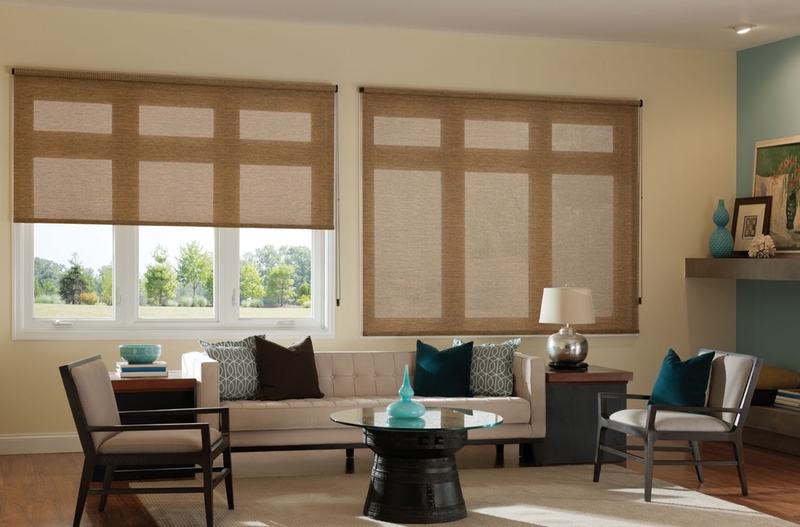 Roman Shades are fabric shades that fold neatly to the top when drawn open.They are available in a Classic Flat design that has no folds when lowered or in a Teardrop design that holds the Roman Fold of the Fabric when the shade is lowered. Select from several different fold sizes ranging from 3-1/2" to 6". Other options include the Top down bottom up feature (allows independent control of the top and bottom of the shade), Continuous Cord Loop (ideal for lifting heavier shades), as well as Fabric Valances and Cornices. The wide array of fabric choices allows clients to choose from multiple textures and opacity levels. Screen Shades are available as window shades (flat fabric that rolls up and down), or as Roman Shades (flat material that creates folds as it is raised). Screen Shades provide excellent U.V. protection and glare control while at the same time preserving natural light without sacrificing view. Opacity levels vary from Sheer to Semi-Sheer, and Semi-Opaque to Opaque. 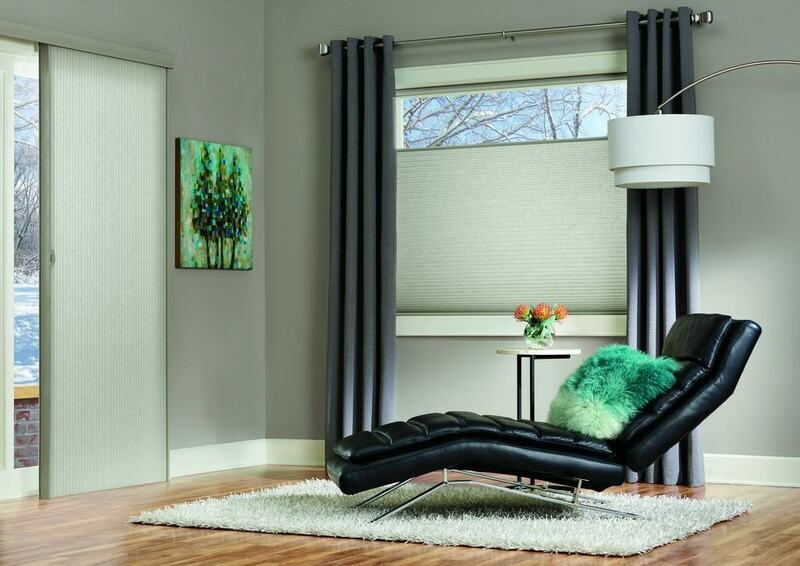 Other options available are Motorization, Valances, and Multiple Lifting options including the Top down Bottom up feature (allows for independent operation of the top and bottom of the shade), and the Continuous Cord Loop (used for lifting heavier shades). 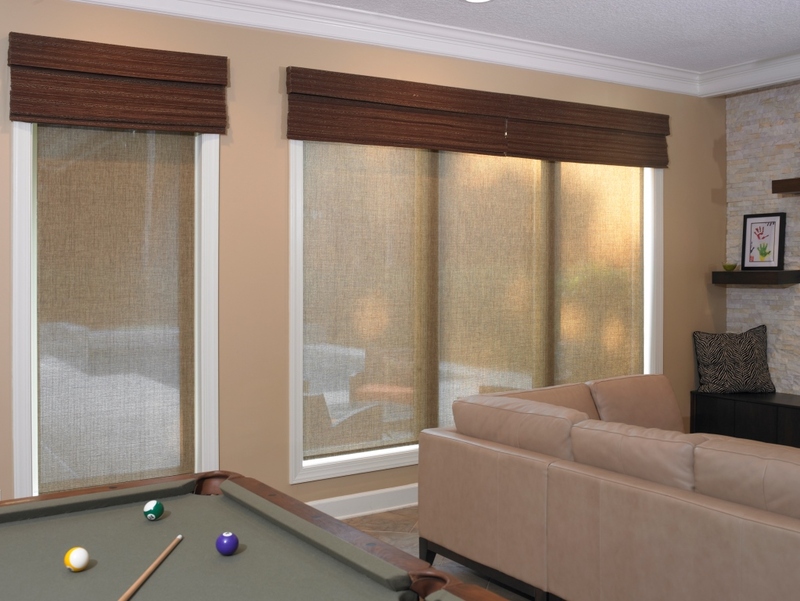 Most all of our Screen Shade materials are durable and easy to clean, which makes them a possible solution for just about any room. 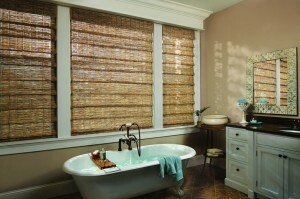 Woven wood shades are made from select woods, reeds, bamboos, and grasses. Each shade is unique, and designed using all natural materials. 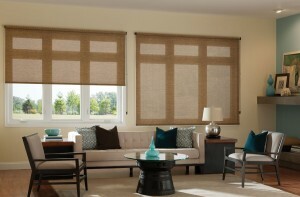 Woven wood shades are available in different opacity options ranging from Semi Sheer to Room Darkening. The weave of the shade determines its light control capability. 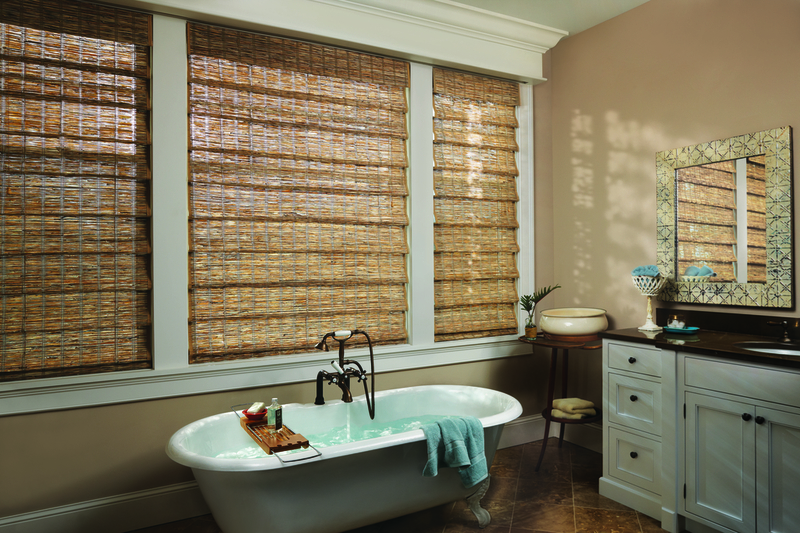 Open weave shades allow more light transfer and outward view. 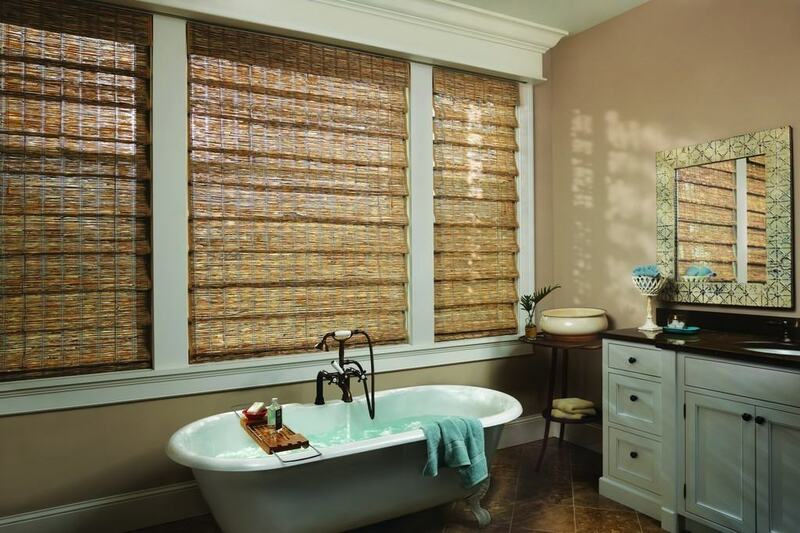 Woven wood shades that are tightly woven tend to restrict light transfer and reduce outward view. Total privacy and room darkening can be achieved by liners attached to the shade or by separate blackout shades mounted behind the Woven wood product. 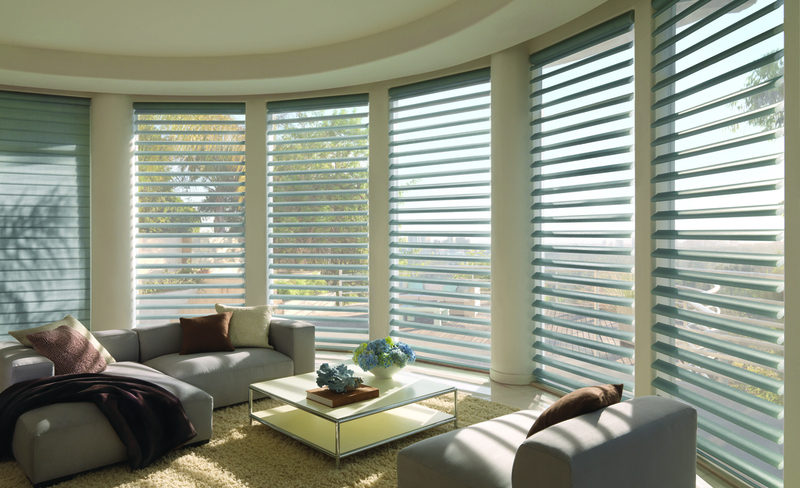 Window Shadings use a combination of Sheers and Fabric louvers to soften and diffuse light. Light diffusion eliminates harsh shadows and adorns the room with a warm glow. Window Shadings are available as either Horizontal Shadings or Vertical Shadings. 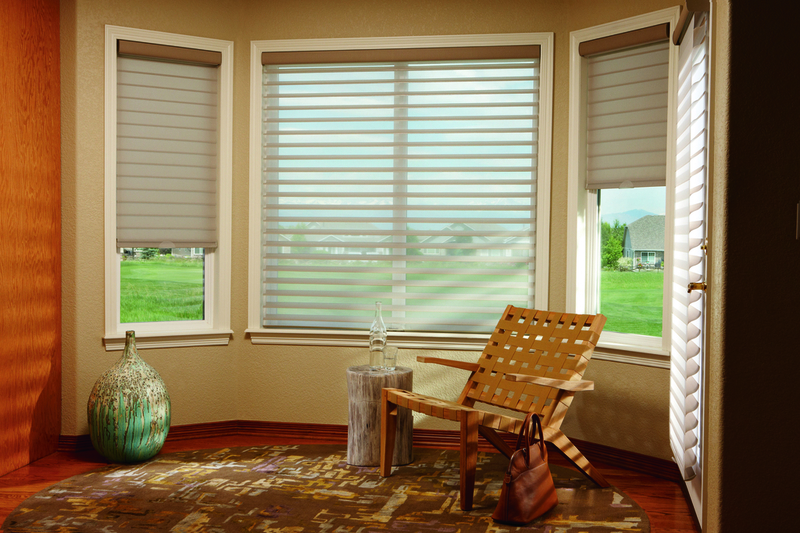 The horizontal Silhouette, Nantucket, Pirouette, or Allure shades will completely rollup into the Headrail to provide an unobstructed view. The vertical Luminette shade gathers on the sides of an opening similar to a drapery. Either Product combines the softness of a Fabric shade with the functionality of a blind to offer unparalleled beauty and performance. Please visit us at our Showroom or call to set up an appointment for your FREE in-home estimate with one of our experienced consultants. "The entire purchase and installation process was without flaw. Everyone was perfect and professional from Kristina in your Showroom to Roger who measured and was extremely thorough in his explanation of what was being ordered, Both Kristina and Roger provided excellent Customer Service. The shutters were installed today by Stephen and Melissa. They were on time and kept me informed prior to their arrival. The installation craftsmanship was Excellent and both were extremely professional and customer oriented. The room was left spotless after the installation. Overall, a Very Positive Experience and I would be Happy to recommend All About Blinds to anyone in the future. Thank You." "I've used All About Blinds in several homes and I have never been disappointed with the product. Steve D was the installer of the shutters I ordered. He went above and beyond to ensure they were level, perfectly aligned, was very polite, professional and had awesome workmanship abilities to ensure they were beautifully installed. Thank you Roger for always being kind to me. God bless." "Today, Charles installed my Hunter Douglas Skyline Gliding Window Panels covering the sliding door. They are beautiful and I am very pleased with the product and professional service. Everyone was so helpful from the beginning, showroom, measurement and installation. Charles did a wonderful job with the installation. Thank you." "Having been married for forty years to the president of a family owned business that has been in existence for fifty-six years, I appreciate companies who employ people who are punctual, polite, well-groomed and can speak the "Queen's English" and answer my questions in a concise manner. And that pretty much sums up the experience that I had today with the young man who came out from All About Blinds to measure and give me an estimate for blinds for my son's home. In this day and age, so many people will take the time to complain when something does not meet their expectations, but never when it is for a job well done. Keep employing great people like Drew Sale and your business will stay on the trajectory that it's on!" "Eric was wonderful! He did a great job installing my shutters and completed the work timely. He was very courteous and knowledgeable. Thanks Eric for a great job. I have had several neighbors ask about my beautiful shutters and I was more than happy to tell them about All About Blinds & Shutters and the wonderful experience I had. Thanks so much."